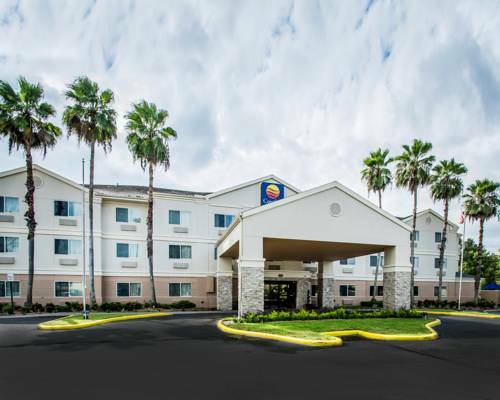 Rest and refresh at the 100 percent smoke-free and pet-friendly Comfort Inn Plant City-Lakeland hotel in Plant City, FL. We are near Legoland, Busch Gardens Africa, Dinosaur World, FL State Fairgrounds, Ford Amphitheater and Lakeland Regional Airport. Get ready for the day with such amenities as free WiFi, free ample parking, free hot breakfast, business and fitness centers, guest laundry facilities and an outdoor pool. Behind every great day is a great night in your cozy guest room, which features a refrigerator, microwave, coffee maker, hair dryer, iron and ironing board. Also, earn rewards including free nights and gift cards with our Choice Privileges Rewards program. Limit of 2 80-lb. pets/room, USD20/night. ~18 miles from Plant City. ~41 miles from Plant City.